Of the thousands of viewers who blew the ITV switchboard in February 1968 after watching the final episode of The Prisoner, it is likely that few had seen or remembered Ibsen’s Brand, or McGoohan’s apparently epochal performance as the lead in that same tractacus-as-play on stage in London in 1959. If they had done, they would have sensed the Brand allusions – verging on parody – in the climactic court scene, with Kenneth Griffith’s judge (or “President” as the credits had it) pleading with McGoohan to “lead us – or go.” The original Brand fails as a preacher or a leader because he cannot compromise the one-way bridge he has erected between faith and reason (cf. Kierkegaard); he knows that, because of the original sundering between God and man, the world can never be perfect, yet is driven to make that same world perfect even if no one else is willing to follow him and the whole world, including himself, is destroyed as a result. There was that same sense of destructive perfection in McGoohan, a man constantly bewildered by the failure of others to see the world and life as he saw and lived it. The Prisoner’s rationale (and spearhead of attack against “rationalism”) is based entirely on freedom, but in McGoohan’s case freedom might have appeared to some to mean freedom to be left alone, to stand apart, to be a pronounced, hugely magnified individual, visible and unmissable in his individuality. Nor was Welles absent from the making of The Prisoner; in town to do his bit on Casino Royale, Welles drove over to Borehamwood to visit his old friend – upon his arrival at reception, McGoohan joyfully announced “It’s all right ladies, let him through, genius is in the house!” McGoohan was shooting the crucial “Once Upon A Time” episode at the time and Welles helped out with the direction and made other key suggestions; somewhere there still exist films of dialogue from the 1955 Moby production, long dialogues between Ahab and Starbuck, out to destroy each other but still in the most precious depths of friendship, some of which appeared in suitably altered form in McGoohan and McKern’s variation on Beckett’s Endgame. And there was no escaping – least of all in “Fall Out” – the influence of Welles’ The Trial. But few paid attention to The Third Policeman. It may seem wearily predictable to retain emphasis on The Prisoner in a career which spanned a jazz-drumming Iago (in All Night Long, with Mingus, Brubeck, Attenborough, Tubby Hayes, the other Beckett – Harry – et al), Jerry Lee Lewis as Iago (the McGoohan-directed film of Jack Good’s musical Catch My Soul), Disney and Cronenberg. But the series – just seventeen episodes, ten more than McGoohan ideally desired – not only raised the bar for television but virtually created it, and Dennis Potter, Alan Bennett, the Pythons and Jim Henson were only the most prominent television innovators who followed his path, knowingly or otherwise (Alexis Kanner in “Fall Out” miming to “Dry Bones” by the Four Lads - Canada sings Canada if we’re talking about a broken social scene - eighteen years ahead of The Singing Detective; and what is Basil Fawlty at the end but an ageing Number 6 locked into a diminishing circular hell of a Village? And as for Number 6’s other unlikely alter ego, Reggie Perrin, the exhausted man who vanishes on a beach and reappears under a different title…well, it could and should go on forever). And yet it was also a programme which seemed to eat the rest of television as it set up its shop, including itself; contrast the relatively glamorous location shoots and setpieces of the early episodes with the blank childishness of “Once Upon A Time” or the unwinding of the ITC biscuit cutter melodrama spool which occurs throughout “Fall Out,” a piece more or less improvised as it was being shot. It drew some remarkable performances from undervalued actors; Colin Gordon’s two stints as Number 2, for instance, make one regret how badly this fine actor was wasted for virtually all of his career. And there were startling turns by people such as Eric Portman, Mary Morris and Nadia Gray, actors who didn’t make a point of appearing on television. Morris’ Number 2 in “Dance Of The Dead,” with all her foretelling of Thatcher (and astonishingly a last-minute replacement for an unwell Trevor Howard), might still count as the most frightening villain ever to appear on the small screen. Cuddly Patrick Cargill rips “Hammer Into Anvil” apart with something in him that is genuinely terrifying (and which he seldom displayed elsewhere in his long and distinguished career). McKern was famously driven to a nervous breakdown and/or heart attack by the intensity of the “Once Upon A Time” shoots and took a lot of persuading (not to mention a shave and a haircut, two bits) to be resurrected for “Fall Out” a year later, and yet even in his starkest moments there is a bearable lightness which strives to preserve his being. Number 6, that entirely logical alter ego of Eastwood’s Man With No Name – their eventual and inevitable meeting in Escape From Alcatraz merely underlined that particular hall of mirrors – wants merely to retire from a world of which he has grown tired and finds himself planted in a world which he cannot quite understand, a compulsory retirement stripped of meaningful work in which he is encouraged to settle for less, fit in, comply. He paces every world he inhabits with the fatal impatience of someone unfit to live in any world – or for whom no world is entirely, i.e. satisfactorily, fit. McKern’s bank manager looks forward to the transformation of the whole world into the Village; McGoohan dreams of being the first man to live on the moon. It is telling that one of the few moments of extended peace he finds is in the self-directed “Many Happy Returns,” the first half hour of which contains perhaps a couple of lines of dialogue, both rendered in unreachable foreign – or invented – languages, as well as some of the most sublime images of the British countryside ever portrayed on film, easily comparable with the work of Michael Reeves. The London into which he literally falls – off the back of a lorry, if you will – never quite transcends the nature of a dreamed fantasy; the curious widow who offers him a kindness he had nearly forgotten (McGoohan is very moving in this sequence, as he tries falteringly to thank her), fashion shoots in Hyde Park Corner, the reassuring tones of Donald Sinden, the slightly nightmarish glare of Patrick Cargill. And it all turns out to have been a dream; he is obligingly parachuted back into the Village, the generous widow is the black-badged Number 2, the reverie swims to its graceful end. Broadly The Prisoner is a story of three halves; he begins by repeatedly attempting to escape before realising that this will get him nowhere; then he attempts to understand and subvert the mechanisms (and mechanics) which run the Village; then his mind evacuates the Village altogether and we are thrust into the dreamed land of Westerns, Danger Man/Avengers pastiches, Number 6 portrayed by a different actor before he ends up, no longer dreaming, in the underground detention centre in which he might have been held all along (however long that may have been – years? A week? Half an hour?). And then he falls out of the bottom of the system. Nothing works out logically; no one – but no one - can be trusted (the woman who wakes up in a replica of her own house and becomes a screaming, gibbering wreck when she finds out where she is turns out to be a candidate for Number 1 – “It was a good idea and you did your best – I’ll stress it in my report”); the Moebius strip is surfed bilaterally; Sisyphus’ stone will be mounted again and again. Democracy is by definition pocket (“Free For All”), information cannot be confused with education (“The General”), the right to dream is almost worth dying for (“A, B & C”). Or simply a portrait of a fatal purist determined to find out why everyone else is not like him – so 6 being 1 makes perfect sense; in fury, he is intent on creating a society of worshipful clones – or a far simpler portrait of a human being struggling to understand the world and relate to it. Consider how in “Do Not Forsake Me Oh My Darling” – one of the most dismissed episodes, but one of the most crucial - Nigel Stock as Number 6 suddenly, in his stout, fiftyish body, becomes everything McGoohan can’t be; he kisses his fiancée passionately (contrast with an eternally tensed up Number 6 who has an inbuilt difficulty dealing with women), his determination becomes focused, he is somehow adult in a way which 6 can never really grasp; thus the second childishness of the playroom and Number 48; the boychild running off with the little child-man, the better to begin a more colourful circle. Or maybe McGoohan just caught The Black And White Minstrel Show on TV one evening and got irritated. Once again we have effusive (as in “effusion” in the knee) sleevenotes by Derek Johnson – it is beyond remarkable that this man was still the NME’s News Editor until well into the New Pop age – which in their somewhat forced ebullience betray the orders of the strapped down community. “…concentrating on the type of songs which are tailor-made for community or party singing,” “Always easy-on-the-ear, continually provoking memories” (of why they resigned? ), “…keep feet a-tapping, to banish cares, and to create an atmosphere of bonhomie and carefree relaxation.” Questions evidently being a burden to others. When straining to expand their panorama, the Minstrels usually come a cropper; the Latin medley is intruded upon by incongruous Dixieland horns and if there were lovable, cheeky Southern black sharecroppers born within the sound of Bow Bells then the Cockney voicings of “Hello! Hello! Who’s Your Lady Friend” seem determined to prove that this is not merely careless thinking. Still more nauseating are the occasional uprisings of patently false bonhomie with whoops and cheers reminiscent of an office party where one is clearly being forced to have “fun.” Their “Singin’ In The Rain” is steadily drained of all life, aspiration and water with nauseating dots of “pitter patter” harmonies. As for the concluding “girlie” medley with such items as “Put On Your Ta-Ta Little Girlie” and “Two Little Girls In Blue” – the bluest of veils is best drawn over such affairs. And yet two songs from this interminable medley of medleys – “I, Yi. Yi, Yi” and “Dry Bones,” the latter of which gets a whole track to itself – play crucial roles in the final episode of The Prisoner (well, the latter does, anyway; the former serves as a nice audiovisual pun to accompany the meltdown of Rover) and I wonder whether McGoohan had the Minstrels at least partially in mind when trying to set so many things right (“Toot Toot Tootsie,” along with Seeger’s “Little Boxes,” was also on the shortlist for songs to be played while 6 walks down the corridor of jukeboxes before McGoohan plumped for “All You Need Is Love”). “Dry Bones,” of course, being about rebirth, not to mention resurrection, not to mention clean slate, the right to embark upon a fresh start without the past tagging you like a can tied to the hind leg of a frightened dog (and all due acknowledgement to Simon Barnes for that metaphor); and so 6/1, 2 and 48 jive around in their truck on the A2 (but weren’t they in North Wales? Forget The Man Who Was Thursday at your peril – “I never knew that we were so close to London ”), absolutely liberated even though they are still, strictly speaking, in a cage. Then there are the times when the Minstrels break away from possum-eating knees-ups, stop pretending to be someone else and begin to sing music they actually feel. Once again the Stephen Foster medley works well because it is clearly heartfelt and no showbiz is involved; just simple but effective choral work and at least the possibility of there being a lump in the throat – the closing “Swanee River” is done slowly and patiently, with a sadness which may or may not mask defiance. Also surprisingly successful is the “Western Style” cowboy sequence of songs wherein the Minstrels, singing authentically white music, suddenly sound entirely at home and at ease. The opening “Along The Navajo Trail” is a fine ballad reading and even the typical wake-up jumpcut to hoedown is manageable; here there seems genuine gusto (even if still relatively clichéd; “hear that banjo” being duly answered by a banjo, etc., and quite what a Bunny Berigan-esque muted trumpet has to do with barn dances is beyond my ken) and at least a semblance of life. And buried deep in the busy scratch mix towards the end is “Buffalo Gal” and it is impossible not to see a fifteen-year-old Malcolm McLaren taking notes. This is not the only unexpected trail laid by the record; the album concludes with the old World War I song “Goodbye-ee,” and I note that a not dissimilar version of the same song made the Top 40 towards the end of 1975 under the name 14-18, a pseudonym for the young Pete Waterman (in conjunction with the other Peter Shelley). Curiouser, however, is the album’s colourful inner sleeve, listing other HMV albums the listener might wish to buy; one side is devoted to classical music, whereas the “popular” side advertises, as well as songs from The White Heather Club and Joe Loss’ Come Dancing, records by Ella Fitzgerald, Lloyd Price, Ray Charles and, dominating the list at top left, An Evening With Paul Robeson. 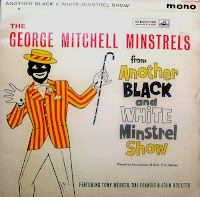 Did the success of the Minstrels – over Christmas 1961 they held down both first and second places in the album chart – subsidise the production of the real thing? When one considers that HMV at the time also had the UK rights to the Impulse! Catalogue – so that other 1961 releases would have included Coltrane's Africa/Brass – the mind starts spinning as busily as the inner workings of Number 1’s rocket (to destroy or recreate the world?). Still, the second Minstrels album plays like Village music to which not contributing to “community singing” would doubtless be deemed “unmutual.” When McGoohan becomes himself again, the Beatles start playing. We have, of course, several more steps to take before we reach that door marked “WELL COME,” and they do not all trace as you might expect. Look at the size of those candles. In my two score plus five years I have never seen candles that big on any birthday cake, not even on dodgy corporate ones concealing strippers. More than anything, they remind me of altar candles, and in a very Cliff Richard way that might make perfect sense. The cake is real and the picture appears by all accounts to have been taken at a genuine party, and yet there is an unavoidable uneasy feeling about the whole scenario, as if something here isn’t quite right, that the picture’s constituent pieces do not seamlessly fit together. But then Cliff is separate and distinct from most of what we recognise as British pop music even as he is simultaneously British pop music personified. 21 Today was his fifth album and his first to make the top (the first peaked at four and the next three in second place), and perhaps there were stern meetings where the Shadows were reprimanded for beating their mentor to number one. Or perhaps not, since the overriding impression from listening to the record is just how much fun he is having in the company of Hank and the boys, and how little he seems to be enjoying himself when compelled to do other things. The record begins with “Happy Birthday To You” – no, this is not the admittedly intriguing prospect of Cliff singing to himself, but a perky instrumental reading by the Shadows. This proceeds harmlessly for a minute or so before voices and clinking glasses are faded into the picture; we are eavesdropping at the man’s birthday party – and Derek Johnson’s sleevenote, which brings new meaning to the term “egregious,” is adamantly keen on emphasising that Cliff was now A Man – and we hear the lad himself calling for gin and orange while indulging in curiously Flann O’Brien-esque anecdotes (“Remember the time I landed on the shores?” “What shores?”), the scenario intruded upon by the occasional, startling hyena-like cackle. It is moderately unsettling but does set the scene, although it’s a pity that the album didn’t run with the full concept (as per Beach Boys Party or Recorded Live At A Sloan Party) and keep coming back to the chatter. Here’s Cliff with his mates, celebrating, reminiscing, taking it easy and performing the odd song – and you would be hard pushed to find something odder than his reading of Chuck Berry’s “Forty Days.” When he storms abruptly from the pregnant intro into the furiously paced rocker that is the song proper, complete with surprisingly febrile growls, he does help to dismantle some kneejerk wisdom, namely that Cliff “lost it” or “sold out” after “Living Doll.” On the pronounced contrary, in the Shadows’ company he was still eager to rock in late 1961 – hear his “call of the gypsy woman” (and remember what he and Bruce Welch would do with that cry fifteen years later) or his throbbing “voodoo/do do” couplets, backed by requisite handclaps and whoops, and it’s evident that he’s trying, really and still trying, to cut into the throb of Elvis. But then other hands who think they know better start interfering. In his sleevenote – as occurs with so many album sleevenotes of this era – Johnson inevitably speaks of Cliff’s gradual transformation into an All-Round (Family) Entertainer and in 1961 you couldn’t really blame Cliff, or anyone else, for going along with this; by then most of the original rockers had burned themselves out, died, got religion, been excommunicated or been neutered and the Beatles were still a bunch of Toxteth scruffs hustling for coins and nights of modest passion in Liverpool and Hamburg. But as soon as the deliberately and infuriatingly coy backing singers simper their way into “Catch Me” the effect is instantly deadening and you can hear Cliff’s interest reducing from top to second gear. Although Hank does his best to make the track interesting – his writhing, descending crescendos after “tumble” and “all over the place” for example – it’s a losing battle; when a song’s central lyrical conceit is “take my tipsy heart,” there is realistically little that anyone could do to improve it. Yet “Catch Me” is the essence of vivid vitality when set next to “How Wonderful To Know,” the first of several identikit 6/8 ballads which finds Cliff backed by Norrie Paramor and his glutinous orchestra and chorus. Now it’s Cliff’s turn to attempt to turn this leaden dirge into something resembling gold (more fool him) with his idly descending “Share-this-love-with-you” incline and his Hertfordshire ski slope of “How-ow-ow-ooh woo-oooo-onderful” but again his endeavour fails; with ration book homilies such as “now and hereafter” to hand, it is what Lena describes as a starched white tablecloth of a song, something even Donny Osmond might have bridled at recording. Worse is to come on “50 Tears For Every Kiss” where Paramor decorates/obscures Cliff’s remorse (“I bought so many kisses” – Lena terms this as “the accountant’s drinking song”) with that depressingly and eerily familiar 101 Strings anaesthesia of cascading streams of dog-pitched fluid. “To Prove My Love For You” is so deferentially mild that we might as well be listening to Dickie Valentine, and in 1951 rather than 1961; like one of those pink-topped cakes from Greggs The Bakers, it is wholly a case of icing without character obscuring the song’s taste. “Outsider” features a Cliff as glum as I’ve ever heard him, dutifully clocking in for another day of joyless labouring because it’s the right thing to do rather than something that he wants to do; as with many of these songs, we could be listening to bargain basement Elvis soundtrack rejects (and given that many of these songs were composed by Col Parker publishing contract hacks Sid Tepper and Roy Bennett it’s little surprise); Cliff sings disinterestedly about “our favourite melodies” (is this 1861?) and is regularly interrupted by a ghastly sub-Stargazers choir (“SO MUCH!”) so by the time he gloomily concludes “Outsider – that’s me” his misery is manifest. “A Mighty Lonely Man” does, as a song, give Cliff a little bit more to chew on (or into), but again, lines such as “a foolish, foolish fool” give limited scope for meaningful interpretation; to his credit, the singer does loosen up, stretching out his vowels, keeping the song within his seldom heard bass range, but once more the abominable Home Service backing stingers scupper any attempt at poignancy or depth; we are left with the impression (as Lena puts it) of a diet Elvis, a low sodium Billy Fury. Back, without much or any regret, to the Shadows-backed tracks; “Tough Enough” is lyrically terrible – night rhymes with moonlight, and marvel at “Hey good people, gonna make her my wife!” – but Cliff has great fun working with seven different varieties of “oooo-wee!” and palpably comes alive again. “The Night Is So Lonely” revisits the 6/8 ballad formula but the Shadows lend a naturally livelier approach than Paramor and at least sound more committed musically, even if they nullify the track with some dreadful echt-Jordanaires harmonies. A far more interesting track is “Poor Boy”; although broadly uptempo and acoustic (in the “Apache”/”Wonderful Land” sense), Cliff, echoing at an odd off-mike angle (and thus sounding like proto-dub), treats it as a study in blue melancholia in his then slightly strained upper register, and the cumulative effect is unsettling; rather than commiserating with the hapless victim of love, Cliff at times sounds as though he’s offering himself as an alternative. Then, however, we reach the album’s nadir, “Y’arriva,” an active equivalent to the drawling, sated passivity of Sinatra’s “South Of The Border” – but that’s as far as I’m taking that particular comparison. From the opening “Way down in the land of sunny Mexico” we know we are set for a journey into light entertainment hell, and so it proves to be the case; here Cliff is the hapless tourist chatting up the local ladies and being railroaded out of town by stock local heavies and he has audible difficulty keeping a straight face; the chorus, as such, is drowned out by proto-Tremeloes yelps of “arriva” (rather than the actual “ariba”) and “andale,” and with a rhyming schemata which allows “In Spanish this means I’m hee-ya!” we are less in the land of Malcolm Lowry and more in the land of Peter Glaze on Crackerjack. The comparison Lena extemporised here was one of what Mexican food might have been like in the London of 1961 (if anyone is old enough to remember what it was like, then please add your comments at the bottom) – nice try but nowhere near (or, indeed, the tourist London of 2009 and specifically “Mexican” restaurants in Greenwich; who the hell thought that tortillas and pasta went together?). Remember, however, that Cliff was now A Man, Old Enough To Vote, Put Away Those Childish Things Yes Mr Paramor Sir, and thus had to Broaden His Appeal. Thus the execrable novelty numbers; but also more interesting excursions like his lounge/cocktail reading of “Tea For Two” with a gently swinging Shadows (although they unaccountably swing into full blown cha-cha in the bridge, perhaps in misguided tribute to the “Tea For Two Cha-Cha” top three hit achieved by the posthumous Tommy Dorsey Orchestra three years earlier), although the active serenity is briefly broken up by a demented five-second Tony Meehan drum solo and marred by a missed dive by Cliff in the song’s first climax where he aims for a high final syllable on “telephone” but his subsequent “yeah” completely misses the key change. His vaguely sensual purr of “onnnn” in the song’s final furlong is quite something, however. 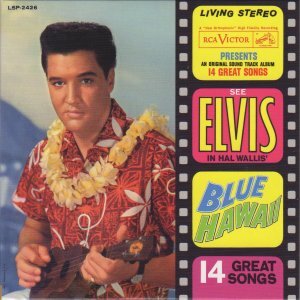 His “My Blue Heaven” is similarly but even more minimally structured; apart from some discreet piano chords by Hank (and his rather bizarre piano introduction), a quickfire guitar solo midsong and the straight faced quick march middle eights, Cliff is largely accompanied by bass and drums alone and curiously sounds twice his age – in fact, there’s a sudden richness and bottoming out of his voice which sounds remarkably like the Cliff of 1982, but more about the latter when we get there (or thereabouts). “Without You” is one of those rare things, a song with a Cliff composer credit (together with Marvin and Welch), and churns along as an agreeable rocker, albeit broken apart by a furiously echoed Marvin solo halfway through and ultimately ruined by the unsolicited return of that stupid backing choir (the Mike Sammes Singers?) at the end. Still, one has to wonder about Cliff’s world; he declares that without his Other, he does not wish to “go on a kissing spree.” Quite apart from having to find something to rhyme with “me,” this is surely unique (or as unique as makes no difference) in British or indeed any pop; a kissing “spree”? And whom would he be proposing to kiss if not his other half? Would he perchance venture out with a shopping list of potential targets (see also the King Brothers’ somewhat creepy “Standing On The Corner” from the spring of 1960)? It’s truly baffling. Proceedings, and the party, are wound up, however, by “Shame On You,” another Shadows-penned rocker with another bemusing central refrain – “Oh, naughty girl” – with a bamboozling mass cascade of “WHYYYYY” and “WAAAAAAAH” following Cliff’s phrase “pretend to cry.” Still, the Cliff of 1961 sounds eminently happier, infinitely more relaxed and far more convincing when rocking with the Shadows than he does when being – well, told what to do, what is right and proper for a Man of His Age. On the rear of the album sleeve he is pictured in a dark suit and tie, proferring bilateral thumbs-up, but not quite smiling. And on his actual 21st birthday, he was dutifully boarding a ‘plane to embark upon his first tour of Australia . Notice that prominent “key to the door” (though Johnson seems to prefer “key of the door”) superimposed on the cover. What if the key led to another cell? Actually, it would lead to a renovated barn, and then to a number nine Routemaster bus (revolution?) but these are tales for other times. In the meantime, let’s take a moment to consider that cake, and the candles which are almost crushing it, in the light of the cake we’ll see at the other end of this decade.